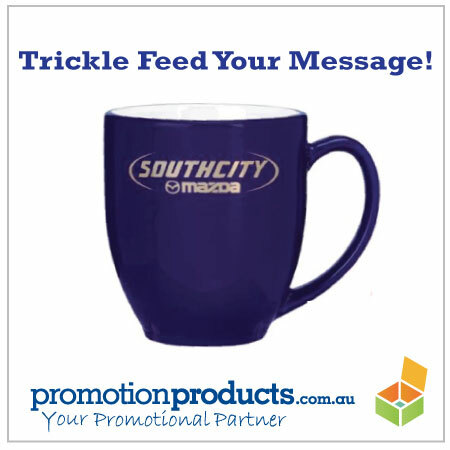 Promo Mugs, Printed Mugs, Branded Mugs, Logo Mugs – they’re all the same. Vessels for holding liquid while displaying corporate, company or organisational messages. They’re good value too with large print spaces and frequent use – so, that’s it, blog post over. Not quite. Think about your kitchen cupboard at home and all the mismatched mugs, the frequent breakages and vacuuming of broken pieces off the floor (don’t you just hate how one little slip up generates all that lost time?). We’re human and accidents happen all the time – and the good news is “it’s not just you!”. In kitchens across the country in homes and offices and garage workshops and building sites and shop backrooms, folks are smashing cups and mugs. Sometimes on purpose….my Grandmother was famous for finding a tea cup with a crack in a restaurant and simply dropping it on the floor to save the germs trapped in the split from causing illness to her or anyone else. These days, the heat in dishwashers annihilates most bugs but back then, a cracked cup was a health risk. So, do we sit back and accept the depletion of our crockery and end up drinking our morning coffee from plastic kids cups? Not round my place….the smart move is to furnish your office and customers’ kitchens with a steady stream of promotional mugs. As they lose china through natural attrition, your trickle feed of mugs will gradually replace all of the other branded mugs that proliferate the shelf above and below the kettle. This entry was posted in business gifts, Desk and Office, Giveaways, Promotional Products and tagged catering, drink, restaurant by admin. Bookmark the permalink.